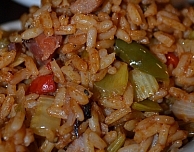 I have more than just Cajun rice recipes, check out more delicious rice recipes below. Grab one of these recipes and impress your family tonight. The dirty recipe recipe is outstanding with fried chicken, and the rice pilaf is wonderful with grilled fish or chicken. 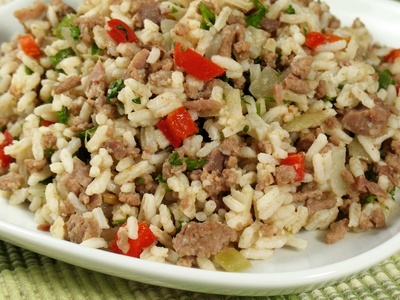 This Cajun rice recipe can be made as spicy as you want. Brown burger with bell pepper and drain excess fat. Return to skillet and add remaining ingredients. Cook with lid on for approximately 30 minutes or until the rice is cooked and liquid is absorbed. Brown the sausage with the red and green peppers; drain. Add the onion, celery flakes, garlic and onion powder, Cajun seasoning, chicken broth and cooked rice. Bring the mixture to a slow simmer, and cook for 10 minutes or until the liquid is absorbed. 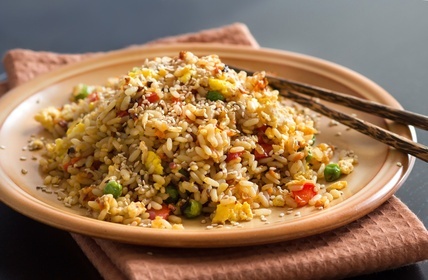 Leftover rice works well for this recipe too. *The original recipe uses chicken gizzards instead of breakfast sausage and if you like them, please feel free to add them. I know it's not a Cajun rice recipe, but this fried rice rocks. Tasty - just like take-out. See for yourself. Heat 1 tablespoon of oil in the wok; add chopped onions and stir-fry until they are light brown in color; approximately 8 to 10 minutes. When browned, remove from the wok. Take wok off burner and allow to cool down slightly. Mix lightly beaten egg with the 3 drops of soy sauce and 3 drops of sesame oil in a small bowl; set aside. Add 1/2 tablespoon oil to wok and swirl to coat the surface. Add eggs and work quickly swirling the egg until it sets again the wok. When egg puffs, flip and cook briefly on the other side. Remove from wok and chop into small pieces. Heat 1 tablespoon of oil in wok and add the carrots, peas and browned onion; stir-fry for 2 minutes or so. Add cold rice, green onion and bean sprouts, tossing to mix; stir-fry for 3 minutes. Add 2 tablespoons of soy sauce and chopped egg to mixture, stir-fry for 1 more minute. It's ready to serve. Garnish with sesame seeds if you are using them. Note: You may add more egg or sprouts, it is totally up to you. I am giving you the base recipe that is wonderful. The recipe is now yours to personalize. Offering more than Cajun rice recipes, please check out more recipes below.